Here offers you the best tool enables you to easily play any videos on LG UHD 4K TV by converting and compress 4K videos to playable formats. 4K Ultra HD (4K UHD) video itself refers to the video of a pixel resolution of 4096×2160 (4,000 pixels, 8.8 megapixels, 17:9 aspect ratio) mainly for digital cinema, or of a resolution of 3840× 2160 (8.3 megapixels, 16:9 aspect ratio) mainly for Ultra HD television. How to enjoy videos on LG Ultra HD 4K TV? Don’t worry. LG is making its best effort to let you enjoy the benefit of 4K resolution on their Ultra HD TVs. 1. LG 4K TVs are the only sets currently on the market to include a high efficiency video codec (HEVC) also known as H.265 for streaming UHD content via the Smart TV interface. 2. LG’s Tru-Ultra HD Engine upscales the picture through a 4-step data analysis that enhances the details of all broadcasts and movies, giving the viewing experience you expect from an Ultra HD 4K TV. 3. LG connects you to the premium 4K content providers like Hulu Plus, Netfix and YouTube direct on the Ultra HD TV. Pavtube HD Video Converter for Mac(review) are highly recommended here, which ables you to convert any video to LG Ultra HD 4K TV format. You can freely play video taken by camcorders, cameras, and mobile phones on all LG 4K TVs, including LG 84UB980V, 79UB980V, 65UB980V, 65UB950V 55UB950V, 55UB850V, 49UB850V, 65LA970W, 55LA970W, 65LA965W, 55LA965W, 84LM960V. Just download the HD Video Converter and follow the steps below to perform the conversion. Step 1. Run Pavtube HD Video Converter for Mac. Click “Add Video” button, load them to the converter. Step 2. Select the items to be converted, and click on “Format” bar. Here I would recommend you select H.265 format which can keep the high definition of the source video. Step 3. Click “Settings” button, then you will be able to adjust audio and video parameters on the popup window to customize the output file quality, these adjustable parameters include codec name, aspect ratio, bit rate, frame rate, sample rate, and audio channel. 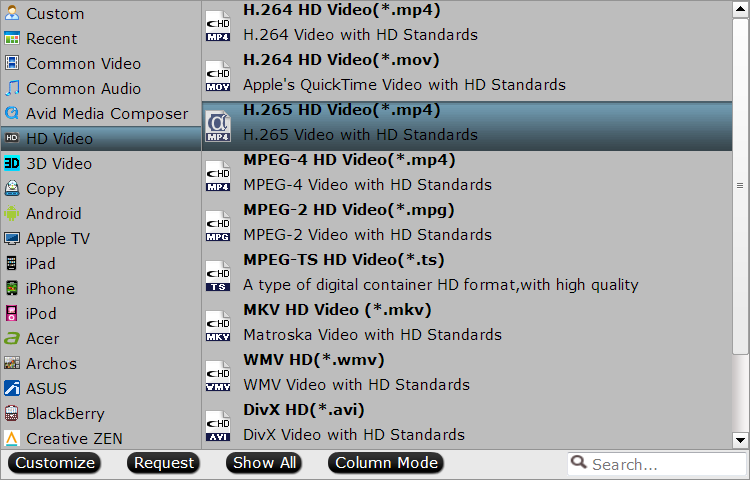 Tips: To maintain original HD quality, you may set “original” in the fields of “Size”, “Bitrate” and “Frame rate”. Step 4. Click the “Convert” button to start converting 4K Ultra HD video. After conversion you can click the “Open” and transfer to LG UHD 4K TV for watching.